Bal`demnic (TNN) – For weeks, Tresarian Peacekeeping Forces have been on the ground supporting the democratically elected government of Krmar II, the Faerytail Family, in defending their homeland against the terrorist organization the Archduchy of Tolonda. After a failure to secure power on Krmar II through legitimate political processes, Tolonda, with support from its ally, the New Republic, has invaded Krmar II and is attempting to seize power by force. 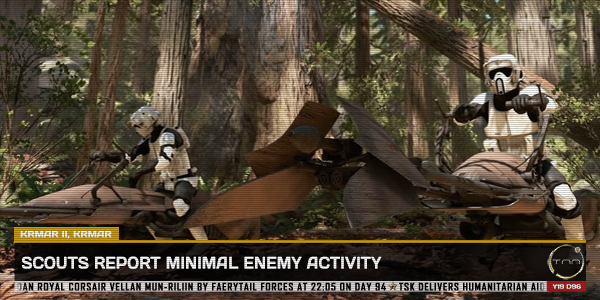 Small squads of Tolondan and Republican soldiers have been spotted at various locations on Krmar II, but following the capture of Corey Vildras by Faerytail forces on Day 70, they have avoided confrontation with any of the Imperial Union troops deployed to defend the planet. Mid-morning on Day 89, Tresarian scouts reported sightings of Margrave Adin Cole, a member of Tolonda’s Royal Council, accompanied by a small group of Tolondan troops near one of Tolonda’s encampments in the northern hemisphere of Krmar II. Tresarian forces responded quickly, surrounding the Margrave and pressing the attack before any reinforcements could arrive. 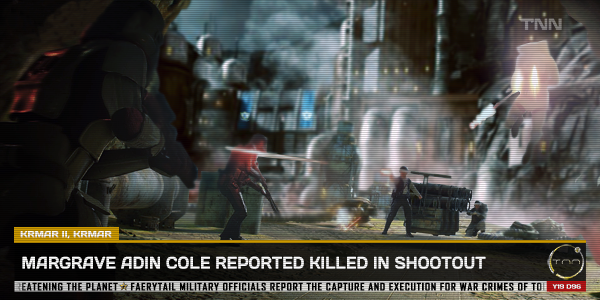 In the ensuing firefight, Cole and his retinue were all fatally wounded or killed. While the Union’s war on tyranny, corruption and orderlessness rages on throughout the galaxy, the defense of Krmar has been rather costless and mostly uneventful. 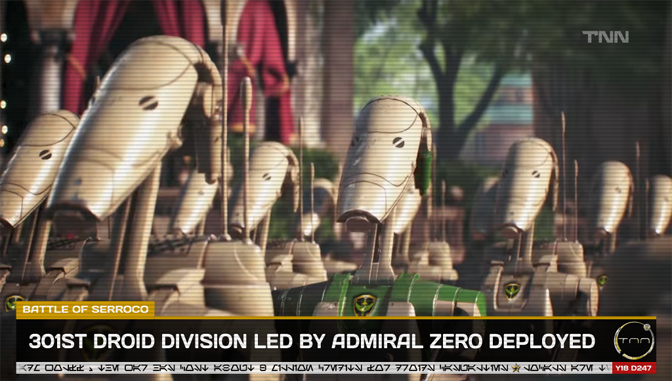 Due to the lack of significant resistance and the fact that no Imperial Union troops have been lost, frontline reports from the Tresarian Ministry of Military Operations merely state that “all [is] quiet on the Krmar front”. Earlier today, King Rexar, the majority of the Hall of Ministers and some of the Kingdom’s highest-ranking military officers were seen entering Kalayaan Castle for an unscheduled emergency session of the Tresarian Security Council regarding the kidnapping of Senior Engineer Helen Hawk and her subsequent extradition to the New Republic. “On Day 336 of Year 19, a little under a week ago, treason, tragedy and terror struck our great Kingdom. Senior Engineer Helen Hawk, one of our newer naturalized citizens, who had joined us after a long hiatus following her resignation from leading the terrorist organization “The eXiles”, a known affiliate organization of the terroristic Galactic Alliance. She asked to be tested for force sensitivity by former Fleet Admiral of Tresario, Sir Kevin Wolff. Knowing that the New Republic still had a bounty on her head, she trusted Wolff, one of Tresario’s longest-serving and most experienced Tikiars, and bravely walked onto his ship, expecting a friend but finding none. Unfortunately, the latter did not return this trust, and restrained her, only to extradite her to the terrorist organization that is the New Republic. In accordance with the principle of freedom, the Tresario Star Kingdom unequivocally and categorically opposes trafficking in all persons; no cause, no movement, no ideal, can justify the intentional kidnapping and trafficking in people by any moral or ethical standard. I am not entirely sure what motivated him to conduct this cowardly act of treason; it may have been greed, eagerness to gain reputation for his new Guild, or just outright hatred towards Tresario. But no matter the reason, his actions speak for themselves. Although I had intended to avoid such hostilities between Tresario and those who I considered to be friends, by disregarding the advice of many of my Royal Advisors, and proceeding to sign the BHG House Agreement in order to ensure the peaceful coexistence of two groups that share a lot of history, I was gruesomely disappointed by the tragic events that occurred last week. Wolff acted with intent when he carried out this premeditated kidnapping. By his actions, he deliberately exploited the spirit of the Agreement. This was a violent and hostile act against Tresario, her values, and her People. It was an act of war, to which the Tresario Star Kingdom will respond with equal harshness. Therefore, on Day 343 of Year 19, the Tresario Star Kingdom withdraws from the House Agreement and declares war on the Bounty Hunters Guild. Further, the Bounty Hunters Guild is declared a terrorist organization. Kevin Wolff, Guildmaster of the Bounty Hunters Guild, is to be considered a severe danger to Tresarian citizens. He is accused of High Treason, Kidnapping, Trafficking in Persons, Terrorism, and Formation of and Membership in a Terrorist Organization. Former Huntmaster of Tresario, Sir Takar Resk, is a collaborateur, knowing about Wolff’s plans but failing to prevent them. He is accused of Treason, Misprision of High Crimes, and Membership in a Terrorist Organization. Both individuals are armed, dangerous, and to be arrested on sight. The fate of Senior Engineer Hawk sadly remains unknown, but according to her request, Tresario will not attempt to negotiate for her release with the rebel terrorists. Although she was only with us for a short time, she will be remembered as a loyal Tresarian, unwillingly succeeding in uncovering what for many was just a faint suspicion. Bal`demnic (TNN) – Large swaths of the southeastern quadrant of the galaxy are still dealing with the aftermath of a string of alarmingly malicious data breaches on companies, news organizations, and data storage centers, primarily on the planets of Malastare, Yelsain, and Pelgrin. Many organizations have found that they have lax data protection safeguards in place, and are ill prepared in dealing with the fallout from a data breach. 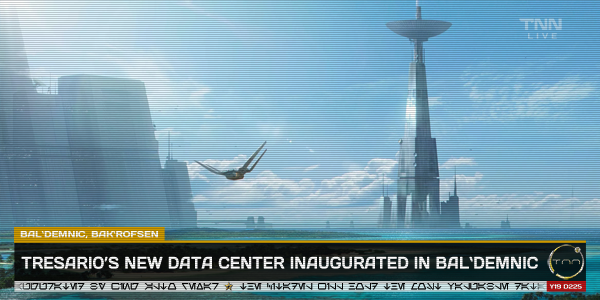 In light of technological advances in the field and considering the recent data breaches across the galactic southeast, the Tresarian Government has recently taken steps to strengthen its data protection regimes, further secure its data infrastructure and platforms, and the construction of innovative and transformative state-of-the-art facilities to remain on the cutting edge of data security without sacrificing Tresarian quality. Once again the Kingdom has turned to legendary developer Lady Ruru Emily, to lead the Star Kingdom forward in the construction of the new facilities, which include new corporate offices, printing press facility, and broadcasting facilities for Tresarian News Network and Freedom Press; as well as new Data Center for the Tresarian Government. Lady Emily is also said to be leading a renovation/modernization of the Tresarian Library and Archives with Sir Clive Redrum. The Tresarian Government and the Tresarian News Network are also taking this opportunity to release new completely rebuilt Holosites, which were developed in collaboration with Amazing Web Services, built on BlazingDawn system and powered by the new TikiarNET artificial intelligence platform. The TikiarNET artificial intelligence platform is currently in the process of migrating and encrypting the Tresarian National Citizen Registry to the new Data Center. As part of the data migration, the Tresarian Ministry of State is asking citizens to upgrade their National Citizen accounts on the new Data Registration portal by accessing Comlink Frequency – #TKRN-F7K43Z291. 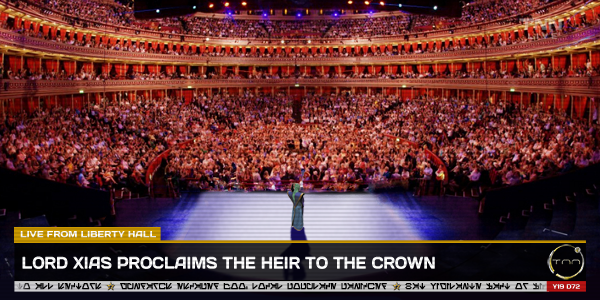 As the crowd cheers, Lord Xias stepped aside, allowing the new Sovereign to address the Kingdom. The Trandoshan confidently steps up to the podium and looks out to the audience. “Citizens of Tresario, Friends of the Imperial Union, and all galactic sentients, today I have the honor and privilege to address you for the first time as King of Tresario. I speak to you now, during this period of profound mourning and loss, to reminisce about our past and dream about our future. King Vatz will remain forever ensconced in our hearts, inspiring and motivating us daily to continue on his legacy and to continue the fight for freedom. He was a fearless leader, a dear friend, and a true statesman. Not just to me but to the Hall of Ministers, the people of Tresario, and the galaxy at large. His life and legacy will be remembered and cherished by all. If someone had approached me a few weeks ago, asking what it would feel like to ascend to the throne of one of the galaxy’s greatest governments, I would have said ‘Great, but I’ll pass.’ To be the King of billions of loyal, freedom-loving individuals who look up to you and trust you with their lives must surely feel overwhelmingly fortunate and fill your soul with pride. On the other side, from what I’ve learned during my four-year tenure as Premier at King Vatz’s side, the amount of work, pressure and responsibility pressing on your shoulders can be stifling. I would have never seen myself capable of carrying this weight. The King pauses letting his words hang for a moment, then Trandoshan smiles as he finishes. King Rexar leaves the stage with the applause of the audience. The screen moves back to the Chadra-Fan reporter. “Well you’ve heard it here. With the full support of the Hall of Ministers, House Tresario and Tresarians everywhere, only one more thing needs to be said. Long live the King.” The screen pans again to the cheering audience and then fades back to the TNN logo. Bal`demnic (TNN) – It is with deep sadness and extreme sorrow that we announce the passing of His Majesty, King Jude Vatz, Sovereign of the Tresario Star Kingdom, Sovereign of the Sentinels of Tresario, Marshall of the Order of Tresarian Freedom, Peer of the Order of the Noblest Rukhar, Nathran of Clan Eu’maios, Patron of the Tikiars, and Citizen of the Tresario Star Kingdom. 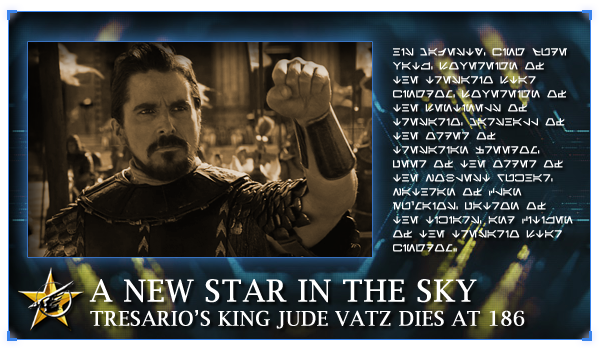 King Vatz devoted his life to the cause of Freedom for the people of the galaxy. Beginning his career in the Falleen Federation, he was drawn to the Tresario Star Kingdom by his friend Landion Domic, then Viceroy of the Kingdom. Rising through the ranks, he became Minister of Governmental Affairs, and later had a short tenure as Premier. With the retirement of Viceroy Domic, King Vatz was chosen to succeed him. He lead the Kingdom from a small nation to one of great galactic prominence and influence. His leadership extended beyond the borders of even the Federation, becoming Secretary-General of the Galactic Alliance. 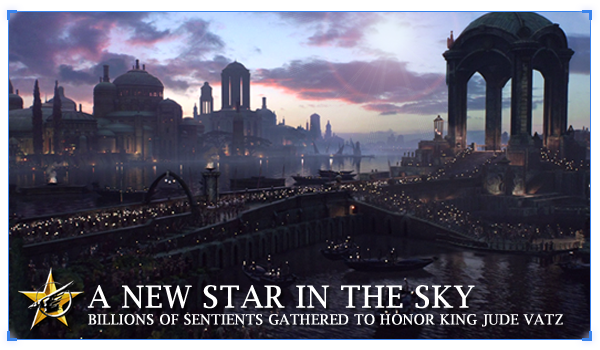 As the Kingdom grew, King Vatz knew Tresarians needed their own voice in galactic affairs. After unsuccessful conversations with the Federation, he led the Kingdom to independence, forging Tresario into a galactic powerhouse. Working with new allies to secure Tresarian influence and security, he aided in the rebirth of the Imperial Union, overseeing the continued growth of the Kingdom. In these final years, King Vatz was diagnosed with a rare disease. Keeping this information to a handful of advisors and friends, he continued his work overseeing the government. His mind remained his most powerful weapon as he saw to the protection of the Kingdom. On Day 47 of Year 19 he eventually crossed the great divide, leaving a legacy unrivaled in Tresarian history. A funeral was recently held in the capital of the Kingdom, where countless Tresarians paid their respects to the Sovereign of seven years. In a historic occasion, the nobility of Tresario are assembled to confirm the succession of the heir to the throne. As they meet, the legacy and vision of King Vatz remains a steadfast guide. They are expected to make an announcement in the coming days. A memorial honoring the late Sovereign will be held in the following weeks. Bal`demnic (TNN) – Following several weeks of tense skirmishes on the sparsely populated planet of Serroco, Death Watch has officially announced their withdrawal from the planet. 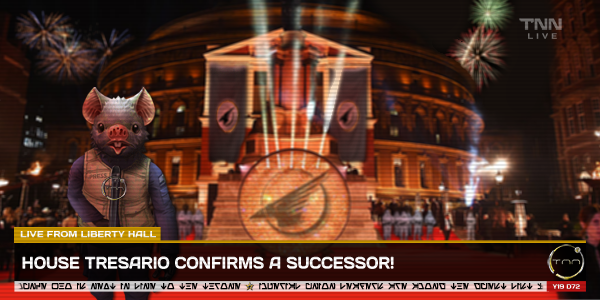 This announcement was met by celebration within the Tresario Star Kingdom forces, marking a decisive victory against the self-proclaimed heirs of Mandalorian culture. Tresarian Soldiers can be seen breaking out barrels of local Tresarian liquor, Kahn’s Wraith, as Death Watch transports ascended into orbit. The conflict began shortly after a scheduled, routine goodwill visit by Tresarian and Galactic Empire forces, where they participated in training exercises, in an effort to bring some stability to the region after months of unrest and shifting political control. Following the training exercise, the Galactic Empire forces returned to Imperial space, while the Tresarian forces remained to continue their humanitarian efforts. 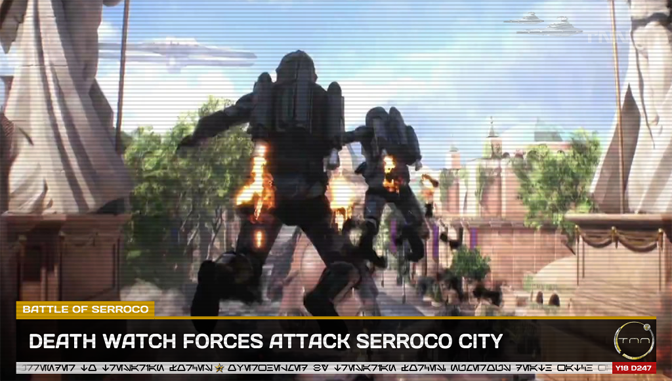 TNN reporters were in the sole population center on Serroco reporting on the remainder of the mission when Death Watch forces led by Peter Max were spotted advancing into the Serroco system. Upon receiving word of the impending attack, the Tresarian military resolved to meet them on the battlefield, and defend the local populace from invasion. While the first two days saw Death Watch make several strong strikes against Tresarian forces, the battle quickly changed to the Star Kingdom’s favor. Death Watch sought to retain control of the battlefield with reinforcements from the Zann Consortium. Few soldiers were able to aid the mercenary forces however, with territorial issues taking most of Zann’s resources away from Serroco. The lack of coordination, heavy loss of warriors, and lack of reinforcements appeared to have had a detrimental effect on Death Watch. 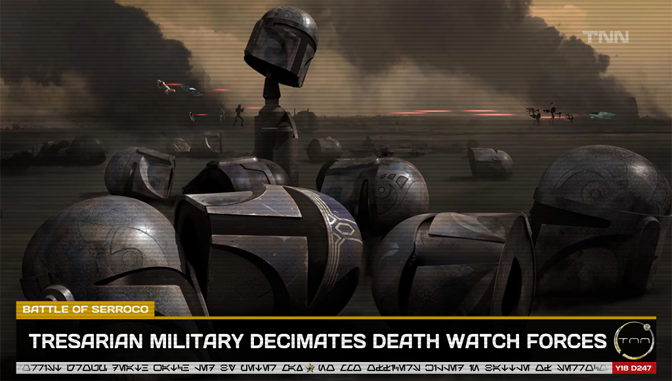 According to reports from Tresarian military command, nearly 600 Death Watch Mandalorian warriors were killed in action, including several highly trained warriors who died early in the conflict. On Tresario’s part, the estimated cost of battle droids lost is a little more than eight million credits. Thankfully, few Tresarian officers were wounded, and none were killed, during the battle thanks to skilled tactics. Due to the bravery and valiant courage of those Tresarians, no civilians or non-combatants were harmed during the conflict. Soon after Death Watch’s retreat from Serroco, Tresarian forces held a small vigil to honor the fallen Death Watch warriors, and cremate those that Death Watch was unable to recover. The battle saw victories for the Star Kingdom beyond simple statistics and casualty lists. One such victory was the rescue of several allied soldiers. As the attack occurred on the heels of a training exercise with the Galactic Empire, several Stormtroopers tasked with final logistical duties were captured by Death Watch in the first wave of attacks. 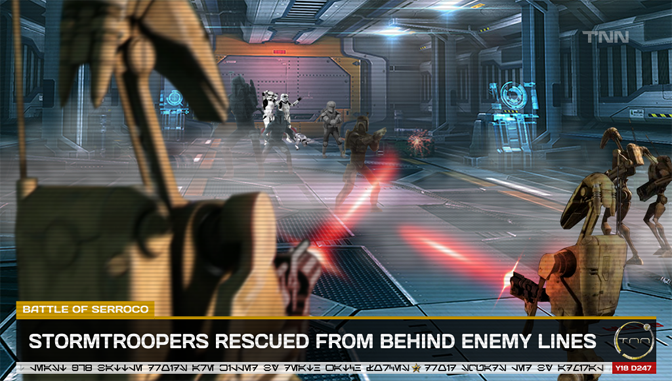 Thanks to the heroic actions of several Tresarian soldiers, one of whom is rumored to be the famed Tresarian hero, Captain Tresario, the Stormtroopers were rescued from behind enemy lines. The soldiers are currently en route to Imperial space to be reunited with loved ones. As celebrations continue, Tresarian forces are proceeding with a clean up operation under the command of Fleet Admiral Sir Kevin Wolff. The operation is going smoothly, with only slight harassment by retreating Death Watch forces, and an attack by a Mandalorian warrior who has been identified as Anon Drekk of Aliit V’r’caah. Drekk attempted to ambush Fleet Admiral Wolff before several Tresarian officers fended off his tactically poor attack. Star Kingdom forces are expected to return to Tresarian space after measures have been taken to help protect the citizens of Serroco from counter attacks by Death Watch. Minister of Military Operations Sir Zeff Traner is reportedly pleased with the results of the operation, though he feels that Tresarian military forces can improve even more in the future. While it is believed that this is not the last time Tresarian forces will face off against the mercenaries, Tresarian military leadership feels confident that the combination of well-trained officers, superior hardware and quick coordination will continue to keep the Star Kingdom safe for the foreseeable future. TMS Honour The Fallen in system Serroco (100, 195). Calaron Razor ended as runner up for the first season of Galactic Shockball League • 31 killed in a catastrophic garbage launcher misfire in Togaboo District, Rangorah • At least 9 people found in Skylane Shuttlebus accident near Jhtura desert, Kubindi • Tresarian Border Control has succeed to stop drug trafficking from Hutt Space. Powered by WordPress | Theme: Greatmag by aThemes. Modified by Marc & Clive. | Copyright © 2018 Tresario Star Kingdom.